Humans for ages have sought peace, happiness, containment, security and an inner silence. Human fears, anxiety, insecurity, enormous emotional violence and an almost insatiable sense of fulfilment have pushed humanity to conquer the highest of mountains and deepest of oceans and yet feel somewhat out of place with the universe. Human beings struggle to become one with the universe, not knowing how to get there humanity strives to achieve freedom through forms, through the next car, next promotion, next relationship, next achievement, next milestone. But happiness is formless and by seeking it through form it gets nowhere. 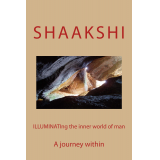 This book is an effort to express the authors struggle for inner freedom. Torn between the pressures of the outer world and the pulls of the inner world the SOUL goes on an everlasting search wanting to be nothing but free, only to find, much to its own amusement, that it never was bound in the first place. A part of humanity breaks through the usual patterns of human suffering and emotional pains and finds something new, a new perspective, a new emotional backdrop for life, a new way of looking at life and a whole new life itself. Nothing has changed on the outer world, the bills have not gone away, people have not turned into innocent angels, newsflash is not about divine dances in heaven yet there is peace and calm within. The fire that is burning on the outside is burning as it is and there is ice cold freshness in the inner world and this makes the outer world a lot more bearable, a lot more tolerable and even enjoyable. And the only thing left for that part of humanity, which feels free, is to share its story with the rest of itself. To tell the world about how a human being finds love, peace, joy, contentment and inner peace, a sense of peace that can never ever be taken away. What is left for it to do is to do is to go and share its story with the rest of humanity so we all may live a happy life together. This book is all out of love.Welcome to the INNER WORLD .